Setting up your kitchen is a fairly simple matter but doing so on a budget might be a tad more challenging. Sure, you know what has to be done but do you have the means to pull it off and, more importantly, will the end result be just as impressive. This mostly comes down to your own skill and prowess and here are some tips to help you out. 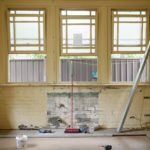 The first thing you’ll notice about your kitchen is the fact that, after a while, the dirt will gather on the walls. All the fumes and grease will create layer after layer on your façade, regardless of how careful you are or how good your exhaust hood is. The best way to save money is to DIY this paint job and you can start by sanding these greasy layers off. Next, you should choose the color but bear in mind that colour also affects your appetite. Therefore, the choice of grey, blue or yellow may be much more impactful in the future than you now assume. 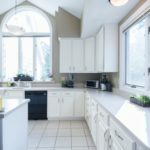 Other than this, what you need to do is refresh your cabinets which, alongside the above-discussed paint job, make the biggest difference in your kitchen. To do this, you need to paint these cabinets and update knobs. This last part is surprisingly frugal and, with the choice of particularly ornate knobs you can easily transform your kitchen into something completely different. Other than this, you can replace the countertop with the one that goes along these cabinet changes. Once you wrap this up, the majority of your kitchen’s large surfaces will be dealt with and you’ll already have a whole new look. 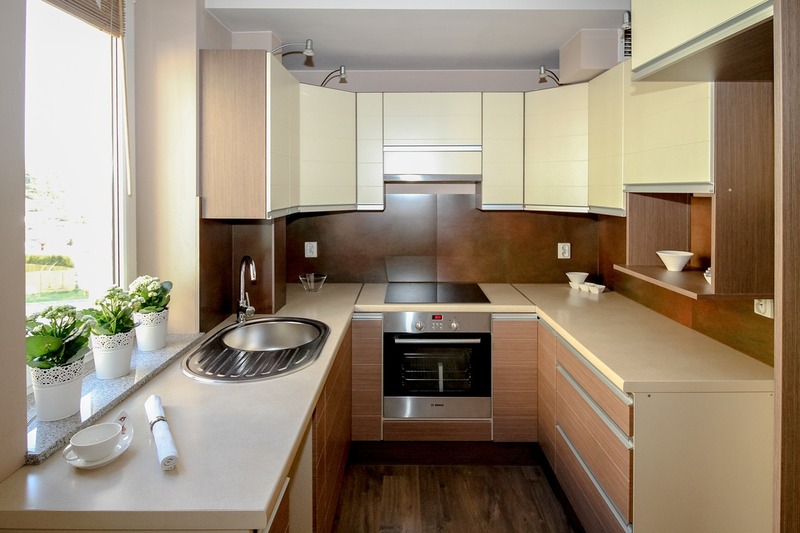 If you’re set to do a full kitchen remodel on a budget, what you’re probably looking for are cheap flooring ideas like painted linoleum, vinyl floor stickers and paper bag faux hardwood floor. Although inexpensive, these options are in no way inefficient. First of all, they’re resilient to spillage and grease, even though they don’t endure that much traffic. Fortunately, the kitchen is not nearly as high trafficked as some other parts of your home (laundry room, for instance). Some options like paper bag faux hardwood floor are quite easy to mistake for the actual thing (real hardwood) without a proper inspection. The next thing you can do is buy appliances online instead of going to a store in order to find them. This way, you can set a filter, when it comes to price, and easily get the device that fits your budget. Other than this, you could even use this option to repair your old appliances. Provided that you have a skilled repairman on your side, you can easily find parts online, thus reducing the total cost of the repair. This can even be done by a model and an appliance, for instance, you could look for Samsung fridge parts, thus making your search more efficient. The next thing you should focus on is changing the lighting in your kitchen. First of all, this is a room that may require a lot of focus, which is why you need to think about task lights. LED also makes a huge difference in overall, long term, frugality over its incandescent counterpart. The only problem lies in the fact that an average incandescent bulb costs a lot less. Still, when you compare the average number of work hours behind each bulb (20 to 50 times longer in favour of LED), you’ll get to realize just how many traditional bulbs does a single LED one get to repair. This will give you another perspective on the comparative cost between the two. Other than all this, you also get to improve your kitchen storage, use wallpaper (even if you don’t want to use it on the entirety of the wall) and look for some new accessories. Still, all of these minor changes are merely there to complement the holistic effort we described in the previous five points. Once you get these out of the way, you can take virtually any direction, when it comes to decoration. Author Bio: Patrick Adams is a freelance writer and rock-blues fan. When he is not writing about home improvement, he loves to play chess, watch basketball, and play his guitar. More than anything, he loves to spend his time in his garage, repairing appliances and creating stuff from wood.